If giant bells are your thing, the Tsar Bell is an absolute must see. The Tsar Bell, also known as the Tsarsky Kolokol, the Tsar Kolokol III, and the Royal Bell, is a 6.14 meter tall bell with a diameter if 6.6 meters. Commissioned by Peter the Great’s niece Empress Anna Ivanovna in 1733, with a thickness of 62 centimeters at its thickest, the Tsar Bell weighs in at a whopping 201,924 kilograms. It has never been rung or suspended largely because it was cracked during the casting process. 11 ton piece of the broken bell. The Tsar Bell stands on a large pedestal in the Kremlin not far from the Ivan the Great Bell Tower. This is the largest bell in the world, weighing almost 202 tons and standing more than 6 meters high and 6.6 meters across. The story of its construction is marked by a series of almost supernatural misfortunes, as if this white elephant was cursed from conception. Empress Anna Ioanovna wanted to entrust the making of the bell to a French royal mechanic, but was refused. Monsieur Germaine judged that it was impossible to make a bell that big. The work was therefore handed to the Motorin father and son team of Russian craftsmen. To cast the bell, a pit 10 meters deep was dug and filled with a clay form and walls reinforced with hard packed earth to withstand the pressure of the molten metal. Obtaining the necessary metals proved a challenge, for in addition to the parts of the old bell, an additional 525 kilograms of silver and 72 kilograms of gold were added to the mixture. After months of preparation, casting work commenced at the end of November 1734. The first attempt was not successful, and the project was incomplete when Ivan Motorin died in August, 1735. His son Mikhail carried on the work, and the second attempt at casting succeeded on November 25, 1735. Ornaments were added as the bell was cooling while raised above the casting pit through 1737. The bell was cast in a large ditch dug in Ivanovsky Square. The craftsmen prepared for the casting for two years, but work had to be stopped when leaking metal caused a fire that burnt down the wooden derrick designed to lift the future bell. It is claimed that after this the elder Motorin “died of grief”. 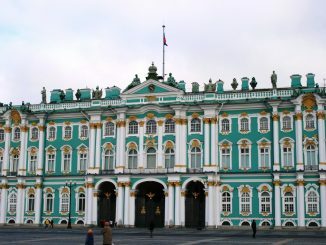 Before the last ornamentation was completed, a major fire broke out at the Kremlin in May of 1737. The quickly moving fire spread to the wooden support structure for the bell, and fearing damage, guards threw cold water on it, causing eleven cracks, and a large 10,432.6 kilograms portion to break off. The fire burned through the wooden supports, and the damaged bell fell back into its casting pit. The Tsar Bell remained in its pit for almost a century. Unsuccessful attempts to raise it were made in 1792 and 1819. Napoleon Bonaparte, during his occupation of Moscow in 1812, tried to remove the bell as a trophy to return to France but was unable to do so because of its size and weight. It was not till 1836 that the bell was raised by French architect Auguste de Montferrand and it was at this time that it was placed on the large stone pedestal it currently resides on. Russian bell founding dates back to the 10th century, but in the medieval Russian Orthodox Church bells were not rung to signal time for church services. They were rung as alarms to fires or natural disasters, and to announce important celebrations and ceremonies. Visitors to the Kremlin today can admire the highly detailed relief work on the bell’s exterior. 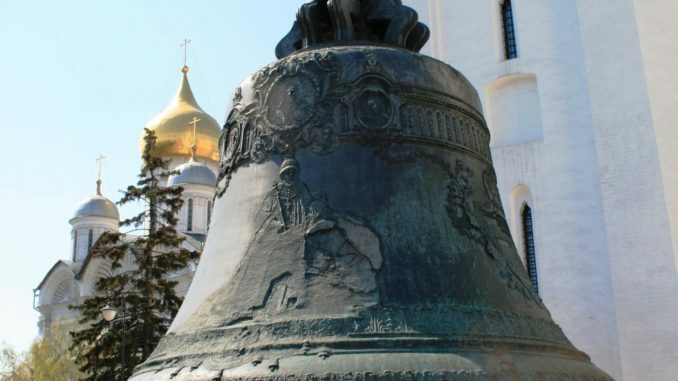 Complete with baroque relief images of Empress Anna and Tsar Alexey, the Tsar Bell also has beautifully sculpted depictions of Jesus Christ, the Virgin Mary, John the Baptist, Russian rulers, and their patron saints. 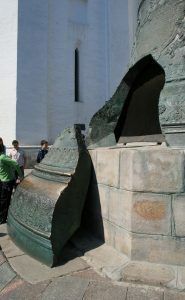 The broken slab alone is larger than the world’s largest bell hung for circle ringing, the tenor bell at Liverpool Cathedral. For a portion of its history, the bell served as a small chapel with people entering and exiting the large opening created when the 11 ton section broke away from the rest of the bell. Though the bell has never been rung, there is a legend that it will be miraculously repaired and ring out for all to hear a call for prayer on Judgment Day. 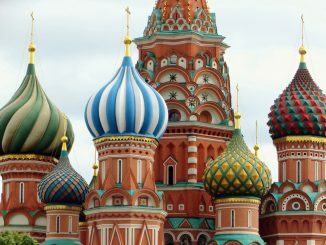 In 2016, a group of researchers at the University of California’s Berkeley calculated the thickness, shape, movement, and materials of the bell and used a computer simulation to create the sound that the Tsar Bell would have made. 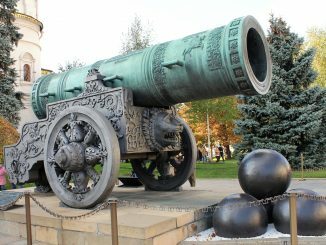 The biggest bell ever working in Russia was cast in the 17th century, it weighed around 130 tons. The biggest working bell is in Sergiev Posad, Russia and weighs 72 tons.